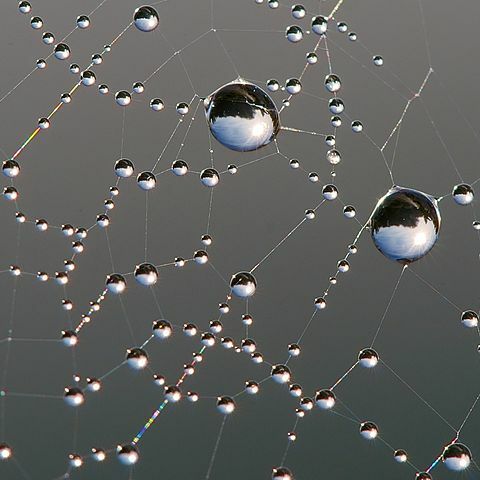 Dew on Spider Web by Luc Vlatour, Creative Commons. Yesterday, around dinner time, I took my wife to the emergency room with severe chest pains. This morning, a little before 9:00, she texted that she was going into surgery in 45 minutes. I hurried over, but had to drive to the roof of the parking garage to find a spot. As I sprinted down the steps, I spotted an acquaintance, who I’d seen earlier in the week at a meeting, who did not look well at all. He was entering the oncology building. I called his name but he didn’t hear me. By the end of the day, my wife was stable. Though not out of trouble or the hospital, her prospects are encouraging. Not so, I believe, the friend I saw. He’s elderly but notable for a heart that is both wise and kind. This is a man who clearly does not have much money. Exactly the kind of man that the oligarchs want to strip of healthcare. It was a sullen day, and windy, with a threatening sky. The kind of weather that reminds you of mortality, even without anything explicit on the horizon. Buddha didn’t flinch from difficult truths, but he did make clear, as the Dalai Lama continues to do today, that in the face of this fleeting world, nothing matters more than kindness to other living beings. In the end – and we shall all make this discovery, sooner than we would wish – everyone’s life is a slender thread, and when it breaks, bank accounts do not matter. Nobility of soul does – very, very much. This entry was posted in Culture, Family, Health, Spirituality and tagged Culture, family, Health, loving kindness, metta, spirituality. Bookmark the permalink. I’m so sorry to hear about Mary and about your friend. My daughter had a double mastectomy today. Tough day for us all. I’m glad Mary is on the mend and Maggie is as well. I hope the best for your friend. The whole health care issue is a difficult one with no simple answers. I hope we can figure out a way. Give my best to Mary. Thanks Rosi. Give my best to Maggie. Best wishes for your wife and for your friend. I very much appreciated the sharing of the Buddha verse from the Diamond Sutra. My husband and I are at the point in our lives where we are both aware that the road ahead is much shorter than the road behind. The analogy above is a good reminder, truly, that the best way to spend that time is in kindness.